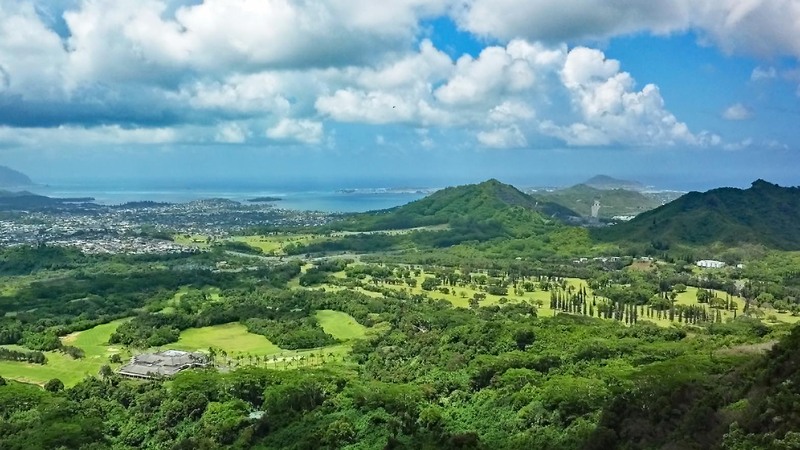 View of Ko’olau and Pali golf courses on Oahu. Interested in Hawaii golf vacations? If so, the islands have more than 80 golf courses. In fact, the Aloha State has eight of the 25 top golf courses in the world. Hawaii is a golfer’s paradise where courses offer views of mountains, lava formations and breathtaking coast lines. Hawaii golf vacations can offer some of the most challenging but beautiful locations to hit the links. Golfing is available on all of the major islands, each having a different flavor. The Club at Hokuli’a on the Kona Coast is one of the few ocean side golf clubs on the Big Island. The course is over 1,500 acres and spans 3 miles, just above the ocean. The Hualalai Golf Course hosts one of the more well-known Champions Tour events. Prefer a leisurely Sunday golfing afternoon? Want to try your luck at the round of glow-in-the-dark golf hosted at night? If so, this renowned championship golf course will exceed your expectations. The course is available for club members as well as Four Seasons Resort guests. Another great option is the challenging and visually stunning Mauna Kea Golf Course on the Kohala Coast. The Turtle Bay Resort & Golf Course on the North Shore has the beautiful Arnold Palmer golf course. Intended for skilled players, it is a challenging course with tight fairways and windy weather. Adding to the course’s beauty is the adjacent Punaho’olapa Marsh where protected Hawaii species live. Another fantastic venue is the Ko Olina Golf Club which hosts an annual LPGA tour event. It features fairways lined with tall beautiful trees, sloping and hilly terrain and views of the Pacific Ocean. Makaha Golf Club is just one hour outside of busy downtown Honolulu. With views of the picturesque Waianae Mountains, it offers an intensely beautiful backdrop for an afternoon of golf. Because it lives up to its nickname, the Garden Isle, golfing on Kauai certainly makes for a splendid experience. Poipu Bay Golf Course tests golfers with water hazards and coastal boundaries. It was once home to the PGA Grand Slam of Golf tournament. It takes experience and dexterity to play well here. Another place to stop is the challenging Kiele Course on the Kauai Lagoons complex located in Lihue. The Hanalei area has some spectacular courses. The St. Regis Princeville Resort is an impressive golf course complex above Hanalei Bay. The Prince Golf Course offers incredible panoramic views of the Pacific Ocean and of the mountains in the north. Golf Digest has rated the course as the Number 1 Golf Course in Hawaii. Designers named the course after Prince Albert, the son of Queen Emma and King Kamehameha IV. The already impressive course recently underwent a multi-million dollar renovation. It is certain to be one of the most striking courses in the Aloha State. Maui alone is home to nine award-winning golf courses at four different resort destinations. One can argue that Maui may offer the most spectacular Hawaii golf vacations. The Makena Resort has two luxurious golf courses over 1,800 acres of beautiful coastal land. Both courses, Makena North and Makena South, offer ocean views and lush island landscapes. The north location is situated among native wiliwili and kiawe trees, streams, lava flows and narrow valleys. The Makena South location slopes down towards the inviting seaside, offering a panoramic view of the Pacific. The west side of Maui offer world class golfing. Here you can find the famous and visually stunning Kapalua Plantation Course. The course hosts a unique, nationally televised winners-only PGA tour event each year. A good round will allow you to say that you’ve excelled at a course that challenges the best golfing professionals in the world. Maui has two golf courses at the Ka’anapali Golf Resort in west Maui and three golf courses in Wailea. So no matter where you stay on the island, there is sure to be quality golf course nearby. The Ironwood Hills Golf Club on Molokai is a historic plantation style 9-hole course. With tall eucalyptus trees and notable elevation changes, this is a beautiful place to golf. On the island that has no traffic lights, the golf course feels just as causal and laid back as the rest of Molokai. The is no clubhouse and no tee times are needed. Lanai is a completely different island for Hawaii golf vacations. Here, you will experience long stretches of wilderness and peaceful views of the neighboring islands of Molokai and Maui. 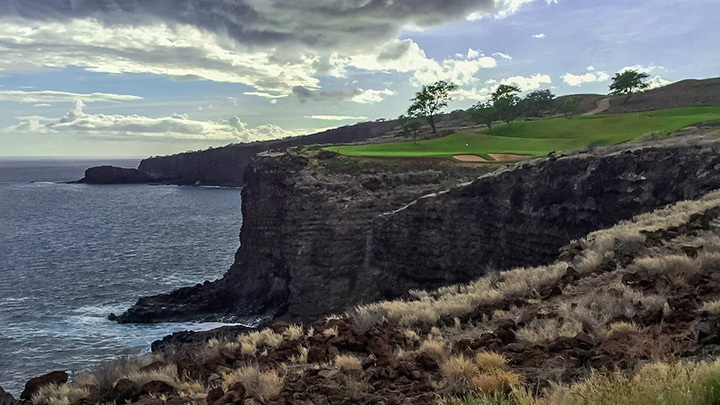 The Challenge at Manele is located above the Hulopo’e Bay at Manele. It is renowned for its difficulty as well as for its striking scenery. This because several of its holes are precipitously close to cliff edges. 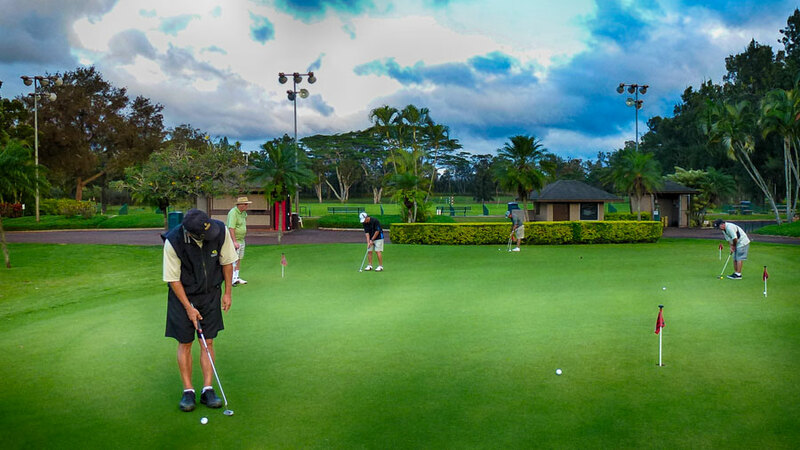 There is also the equally challenging Experience at Ko’ele golf course, which is a part of The Lodge at Ko’ele Resort.